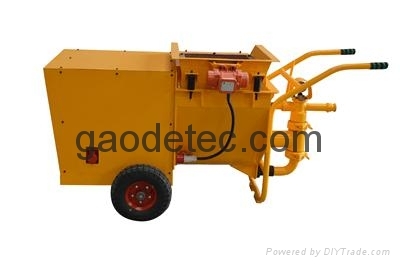 Cement mortar spraying machine is a high reliability, adaptability, durable, easy to operate spray device. But also a new energy-saving environment-friendly construction machinery, based on advanced technology research and improvement of Germany's machinery, and taking into account the characteristics of construction and construction materials. This new machine is very suitable for all types of gypsum spraying construction and engineering. Mortar cement sprayer using the latest hydraulic piston structure, and the use of piston reciprocating principle, reciprocating feed, feed pressure uniform, no pulse.